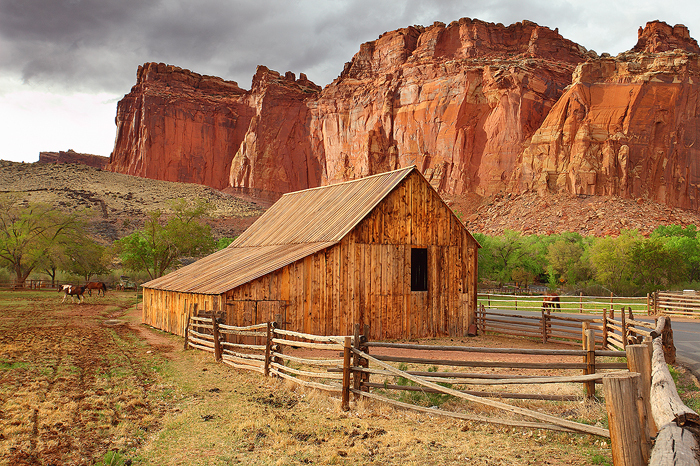 A farm, originally built in the early 1900's sits nestled in the lush and fertile Fruita Valley in Capitol Reef National Park. For many decades this was a working farm which provided the family that lived here everything they needed to survive. Today the National Park Service maintains the farm land as a working historical farm. It's not hard to believe the mormon settlers who homesteaded this lush green valley in the middle of the harsh desert weren't the first people to make use of this land. Just a few paces from this barn, the mesa walls are adorned with beautiful petroglyphs left behind by ancient native americans. Most of this rock art is attributed to the Fremont People who inhabited this area of Utah from AD 600 - 1300. The Fremont people were contemporaries of the Ancestral Puebloans (Anasazi) of the four corners area.